I got this book in the mail and I was honestly confused. I didn't remember requesting it and although it was about a preacher (which is usually an automatic yes for me) I wasn't so sure about the plot. And then I started reading and I realized that this book is the second in the Archer Brothers series- I LOVED the first book! 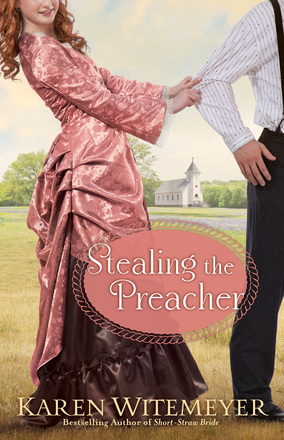 Stealing the Preacher follows the relationship between Crockett Archer and Joanna Robbins. The book started out a little rough - I honestly wasn't sure if I could get into it. I think probably the first 1/4 of the book, I contemplated DNF-ing it. I am happy to say that it picked up after that and was quickly paced and as interesting as the first book. The romance story between Joanna and Crockett wasn't sudden and intense. It was a slow growing relationship (he actually was interested in a different girl at the beginning of the book!). I appreciated how they seemed to have a natural relationship grow through the story, instead of some insta-love that happened in the first few chapters. The main storyline didn't feel nearly as dramatic as Crockett's side story. It was interesting to read how more dramatic that one was (and it was a little surprising.) Stealing the Preacher was a solid sequel to Short Straw Bride. I look forward to reading the next book in the series. It isn't a life-changing series, but it is entertaining.